Home / Blog / Why Are English Teachers So Unteachable? My headline is intentionally provocative. Sorry about that. I’m sure there are plenty of humble, teachable English teachers in the world. I just seem to encounter a lot of particularly pugnacious ones. Maybe a blog like this attracts the stubborn ones in unusually high numbers. If you are an English teacher who is open to new information and willing to change both what and how you teach, I commend you and offer you my apologies. My experience tells me, however, that you are in the minority. Allow me to illustrate. Never start a sentence with and or but. Never start a sentence with because. Never start a sentence with however. Never write in fragments or run-ons. Any of the above infractions, she told me, results in points deducted from her papers. Yikes. What’s crazy about this, of course, is that none of these rules are real. They may be generally good advice for beginning writers–training wheels for novices, maybe–but, let me repeat, these are not real rules. They are myths that have been promulgated by perhaps well-meaning English teachers for generations. I admit that I enforced many of them in my early days as a teacher. I enforced them because I was told they were rules by my English teachers, who, I assume, learned them from their English teachers. That’s a good excuse for newbies. But it seems to me that any teacher worth his or her salt would eventually do some–you know–research in order to verify these rules they’ve been teaching. Because if you do any research on these issues–start with Google if you like–you’ll quickly learn that all of these rules are at best specious. Most have their roots in a spate of late 18th-century writings by prescriptive grammarians. None of them holds up under scrutiny by anyone serious about grammar today. It’s fine to start sentences with and and but. It’s fine to start with because or however. In fact, the only dependable rule about starting sentences is this: Any rule that says you can’t start a sentence with any particular word or part of speech is not really a rule and can safely be ignored. Feel free to end sentences with prepositions as long as your meaning is clear and you avoid superfluity. Everyone writing about grammar backs me up on this. Except hard-boiled English teachers. Infinitives? Split away! The prohibition against splitting infinitives has no basis in logic or aesthetics. Writers of all stripes have been effectively using fragments and run-on sentences for centuries. There’s no reason to insist on only complete sentences in most kinds of student writing. Passive voice exists for a real and practical reason. Bad writing often relies on it unnecessarily, but that doesn’t mean it can’t be used effectively. Teach kids how to recognize those situations rather than pretending passive constructions are forever to be avoided. The prohibition on adverbs is the silliest of all. Just because young writers occasionally overdo it with adverbs doesn’t excuse teachers from making up rules that outlaw an entire part of speech. Could I qualify these statements? Sure. Sometimes it’s a bad idea to start a sentence with any of these words. Often active voice is better than passive. Wording a sentence to avoid ending in a preposition is sometimes a good idea. But that’s English for you. It’s just what happens when we speak and write in this complex, subtle, and wonderful language of ours–this language that constantly defies simplistic rules. I’m all for suggestions and principles and rules of thumb. It’s turning general advice into unbreakable law that I can’t abide. My point here, however, is not to debunk grammar myths. I’ve done that elsewhere more thoroughly. It’s simply to ponder the mysterious rigidity of English teachers. Why is it that when I address issues like those above that the most hostile rebuttals tend to come from professional educators? Certainly part of it is simple pride. 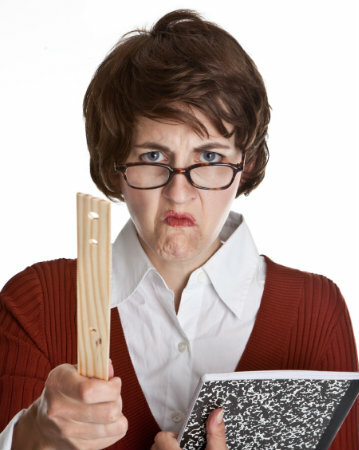 It requires unusual humility to acknowledge that you’ve been teaching students incorrectly. That may be an embarrassing error to admit. I get that. Nobody wants to confess that they lack knowledge in their area of expertise. I think it’s more than pride, however. I think fear plays a factor as well. Most of us find comfort and security in rules. We like guardrails on the language. The constant change that takes place in language can make us feel a bit helpless. It’s impossible to keep up with language trends in youth culture. Language is a choppy sea and hard-fast rules seem to make it more navigable. Actually, as much as I can relate to these fears–that language is out of control, that English is falling into disrepair, that future generations will have lost the beauty and propriety of English–I no longer fear anything of the kind. I’ve come not only to accept that English is unpredictable and uncontrollable and subject to change, but to relish this idea. I have learned to love the evolving, creative, rule-defying rebelliousness of English. I like that few rules hold up under scrutiny. I no longer fear that language is losing its beauty. I think it’s just moving from one style to another. But whether you like it or not, you must admit that most of the rules we’ve been ingrained with have either changed or were dubious to begin with. You must admit this, that is, if you want to maintain integrity as a teacher. Because it’s true. Don’t take my word for it. Invest in a recently published usage guide or two. Study up. This shouldn’t be a challenge for you. After all, if you are an educator, you should be more open than anyone to education. Then come clean with your students. If you have insisted on rules that you learn weren’t legitimate after all, confess your mistake and tell them how excited you were to learn something new. You will not only be teaching them more accurately, but you will also become a model of humility and love of learning. I’m one of those English teachers (and a WriteAtHome coach) who likes the rules. This blog is a good reminder for me. 🙂 Thanks, Brian! Great post, Brian! I’m always saying that rules serve writers, not writers serve rules. I tell my writer friends that grammar and especially punctuation is used to get their meaning across in a way that leaves the reader sure of what they mean. It takes some of the pressure and even fear out of writing for them, especially as it pertains to comma use. I also say to them, “Forget the comma rules you’re trying to remember from grade school and use commas only to make your words make sense.” Not only does that make them write better, it makes them more willing to write without the worry of doing something wrong. I think I fall into the trap of wanting to have a set of rules to follow as a guide. Far too often I’ve been told that I don’t look over my work for mistakes. Besides a few spelling errors or word usage mistakes, I couldn’t tell you what those mistakes are. Would guidelines help me? Would they help my kiddos? I don’t know. But I do enjoy a post like this that suggests that exposure to rules is fine if they are viewed as recommendations. That’s very comforting. I see the benefit of having a strict set of rules. But I don’t think I’d like it any better. I’m not saying there are rules, by the way. There are. But they aren’t created by some body of language experts and dictated to the rest of us. We all arrive at the rules by consensus. The fact that we are communicating just fine is evidence that we all instinctively know the vast majority of the rules. It’s the odd and occasional issues that give people headaches. With those, there’s usually lots more grace than sticklers want to think. You don’t need a set of rules. If you aren’t sure, use Google. If someone points out an error, verify before taking their word for it. Lots of errors spotted by grammar Nazis end up not being errors at all. Others may be errors or just quirkiness.